Wall Mountable, And Perfect For Apartments And Dorm Rooms. Stuff Points: Earn 166 points when you buy this stuff. Perfect for small spaces, or folks on the go, this compact clothes dryer works incredibly well for smaller loads. Get up to seven things completely dry, and use very little energy in the process. It works by blowing air inside the chamber, but it's not as hot as larger machines, and there's no tumbling, so it's more way gentle on fabrics. With two types of hangers already in place, it can easily adapt to shirts, sweaters, towels or pants, and you are guaranteed adequate air flow for quick and efficient performance. Included hardware allows you to mount it to any wall for added convenience, and the space saving design folds flat when not in use. Plug it in to any standard wall outlet, and easily adjust timing to suit your specific laundry and load size. Perfect for the compact living quarters encountered in apartments and dorm rooms, but also nice for RV travel and other situations where laundry facilities don't normally exist. The lightweight design makes it easy to handle, and simple to install on any wall. Skip the trip to the laundromat, and stop using shared facilities. This compact and affordable appliance allows anyone to dry clothes at home. Small. Big enough to get the job done, but also able to fit anywhere, and stay out of the way. With the flexible, main compartment, and folding design, it expands for use, and then compacts when you're finished. Powerful. A clever design and efficient operation make it work really well. With less heat, no rotation, and a smaller hit to your energy bill, the Solaris offers incredible performance. Fold-able. Quickly install it on any wall for optimal performance. The included brackets easily support the lightweight appliance, and then you can easily flip it out to use it, or fold it back up to save space when you're done. Versatile. From delicate silks to heavy wool sweaters, this thing can dry almost anything. It has two types of hangers to make supporting any type of laundry easy, and the large drying chamber is big enough to accommodate most things. Environmentally Friendly. With no more trips to use coin operated machines, you will save gas, and pollute less. Because it uses less electricity than bigger alternatives, energy will be saved each time you choose it over other options. Gentle. The air it blows is not super hot, and it doesn't have to toss your clothes around to make the air flow efficiently. This results in less wear and damage to fabrics, so regular stuff will last longer, and delicate things will be compatible. Lint-Free. It won't agitate fabrics like tumble machines do, so fabrics won't break down to leave behind lint. This leaves laundry looking better, but also ensure it will last longer. Simple. No complicated install, and no fancy connections required. Just plug it in to any outlet in your house, and you are good to go. Dimensions 22" x 19" x 41"
Uses Get clothes completely dry in less space and with less energy. A lightweight and portable appliance. Compatibility Plugs into regular power outlet. Works with any clothing that fits. Wall Mountable Yes. Hardware included. Folding Yes. Fold out of sight when not in use. Efficiency Uses much less energy when compared to large units. Compact and portable, it can adapt to any living situation. Reduce lint, dry delicate fabrics, and use way less energy. 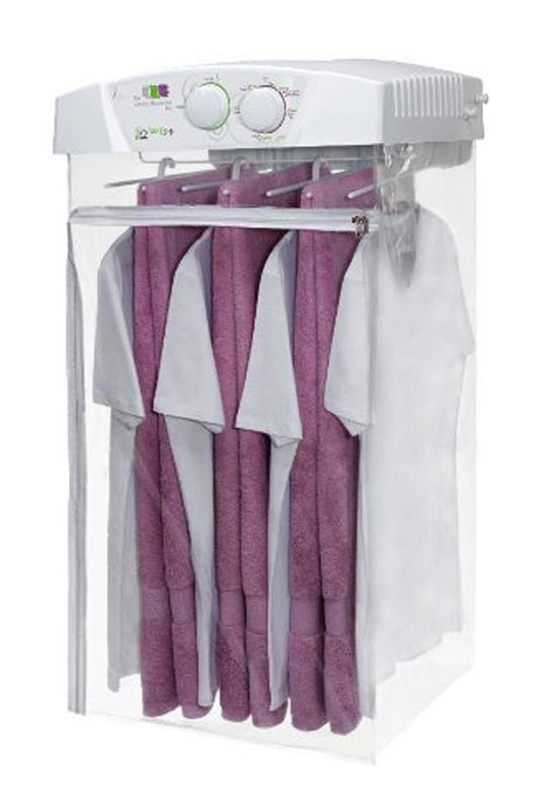 Perfect for places where large machines don't fit, but ideal for anyone else that wants a smaller, gentler, and less costly way to dry laundry. Order Yours Today. how long is a load on that dryer, and if it will completely dry the item as a regular dryer? The length of time will vary based on what you set. 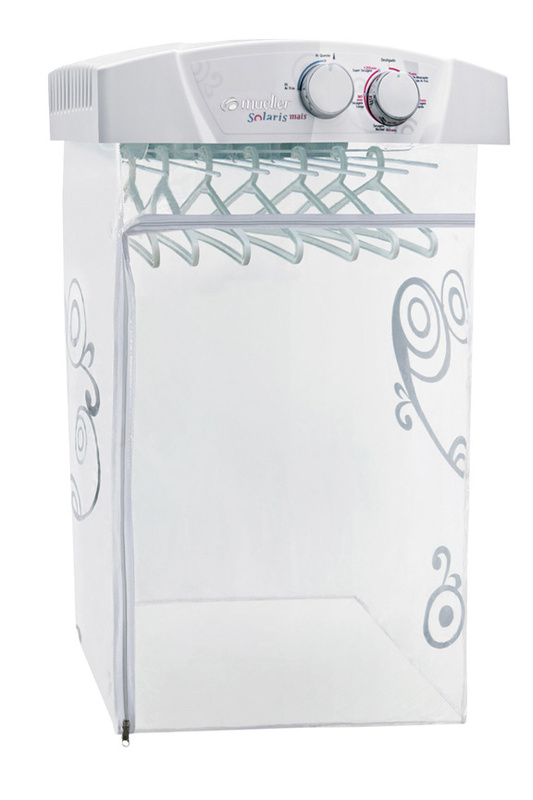 Unlike the spin dryers we also carry, this one is designed to completely dry any laundry you put inside. 7 of 18 Customer(s) found this Answer helpful.